Fancy an evening out at the cinema? Whether it's a family treat or a romantic date, the cost of a trip to the movies can really add up. Thankfully, with an Odeon promo code you can treat yourself to a great night out without spending a fortune. Whether you want to see a popular romantic comedy, be thrilled by the latest blockbuster or indulge in some classic films, an Odeon discount code means you can have fun for less. The very first Odeon Cinema was opened in Perry Bar, Birmingham in 1930, establishing itself and the brand as somewhere to public could go and immerse themselves in the cinematic experience. Combining what was at the time ground-breaking audiovisual technology with iconic Art Deco architecture, the first Odeons helped to create the concept of 'going to the cinema' as so much more than simply watching a film. Today, Odeon is the best-known cinema chain throughout the UK and Ireland and the largest cinema chain in Europe, with a sparkling Leicester Square flagship venue that has hosted over 700 of Europe's biggest film premieres since the 1930s. Odeon has always been at the forefront of cinema innovation and development, opening the first multiplex in the UK in Milton Keynes and offering both IMAX and ISENSE technology for extraordinary cinema viewing. The company operates London's BFI IMAX, the largest cinema screen in the UK, and runs the UK's biggest cinema loyalty scheme – Odeon Premiere Club – with over 2 million members. Across Odeon's 100 cinemas and 850 screens, customers can enjoy the very best film viewing experience with cutting edge technology and a wide selection of entertainment options from the latest releases to live sports and cultural events. In addition to the classic popcorn and soft drinks many locations also have a Costa Coffee on site, Ambar cocktail lounges and more. Cinema-goers can further enhance their experience by choosing a Gallery package with unlimited popcorn, soft drinks and nachos or by opting for the Lounge, which is the ultimate in luxury cinema-going. The selection of films on offer at Odeon cinemas is interesting and diverse, with new releases taking their place alongside children's films, classics, Bollywood movies, home-grown British cinema and more. And while facilities vary depending on where your local Odeon is based, you can be sure every time you visit that your experience will represent a company with a love of the cinematic experience at their core. Want to plan a night at the cinema? With an Odeon promo code you can make big savings when buying your tickets. Whether it's date night or a fun trip with friends, Odeon vouchers will help you experience the movies for less. Browse our website until you find an Odeon discount code that suits you, then navigate to their website to book your tickets. Select your local cinema and click 'Go'. Choose a film and showing to book. Select your tickets and click 'Confirm tickets'. Choose your seat and click 'Confirm seats'. Enter your Odeon voucher code and click 'Apply'. Want to find out more about what's happening at your local Odeon? Why not check out their dedicated YouTube channel? You'll enjoy access to plenty of exclusive content including trailers for upcoming films, interviews, footage from premieres at the Odeon Leicester Square and much more. You can also use the channel to find out more about saving money with Odeon vouchers. Navigate to their website to book your tickets. Enter your Odeon voucher codes and click 'Apply'. Enter your details and click 'Enter card details'. Enter your payment details and click 'Pay and complete order'. Need to contact the team at Odeon? Whether you have a question about your booking, want to know more about an upcoming film or simply want to find out how you can make big savings with an Odeon promo code, you can contact the Customer Services department by telephoning 0871 2244007 or accessing the online contact form here. Want to find out what's happening behind the scenes at Odeon? You can follow the company across all your favourite social media networks for competitions, film news, Odeon offers and more. 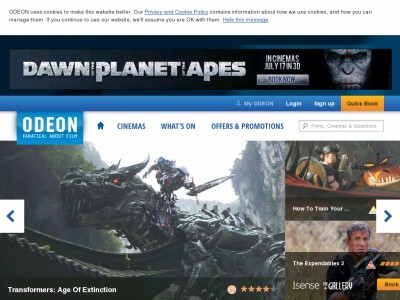 Don’t forget to check them regularly, as you can never be sure when a free Odeon promo code might be waiting for you! Are you a cinema-lover that's often on the move? Thanks to the official Odeon app, you can now manage all your cinema visits directly from your mobile device. Watch trailers, find out where your nearest Odeon is, check what's on and even book tickets and select your seats – all at the touch of a button! Buy now online at www.odeon.co.uk. Odeon.co.uk is always one of the first sites I visit when I feel like going out to catch the newest blockbuster movie, and with an Odeon promo code, I can always save money on all my favorite movies! Odeon vouchers ensure that I’ll have extra money to spend on popcorn or a drink, and since getting an Odeon discount code is free with no signups required, there’s simply no reason not to be using them! So before you go to catch the newest flick, be sure to stop by and pick up your free Odeon promo code! Cost per call: Calls cost 10p per minute plus network extras.